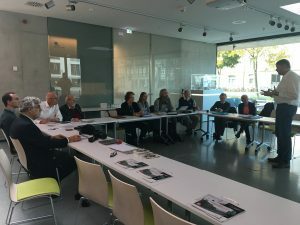 The sixth scientific meeting of ISHRAD was held in the Siemens museum , Erlangen, Germany on Oct 14, 2017. 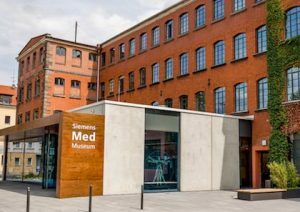 The venue was the Siemens Healthineers museum which was opened in 2014 on the old factory site of the early firm founded in Erlangen by Reiniger , Gebbert and Schall which was later amalgamated with Siemens in 1932. 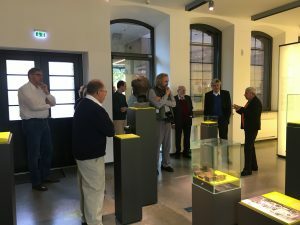 The museum houses material pertaining to the history of radiology technology as well as other medical exhibits such as dental equipment and pacemaker technology. The contributions of the Siemens company in this field is well chronicled. Delegates had the opportunity to explore the historical exhibits and see the early equipments first hand. Doris Vittinghoff former head of the museum opened the conference with a talk on the history of the company in Erlangen and the development of the museum. Today Siemens the giant German engineering conglomerate is a major employer in Erlangen and is a major player in medical technology development and manufacturing. One can sense the frantic activities that must have been occurring all those years ago on this site , now a tranquil venue given over to the reflection of Siemens considerable achievements in facilitating today’s unmistakable modern high tech medicine. The museum took four years in planning between 2000 and 2014 and a modern glass annexe was added to the old brick walled building whose ground floor was used to house the exhibits. 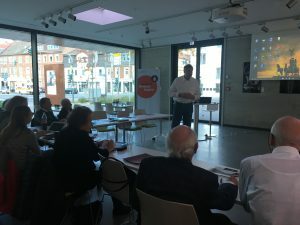 Adrian Thomas from UK then spoke on ‘Siemens as illustrated in philately and ephemera from the collection of Adrian Thomas.’ The audience learnt about Siemens connection with the house of Hannover .The Siemens brothers were all brilliant inventors. Sir wiliam Siemens patented the dynamo for lighting in 1867. Werner von Siemens invented a telegraph that used a needle instead of Morse code. In 1879 Werner Siemens demonstrated the first electric railway. Early factories were based in Berlin, Erlangen and Nuremberg at the turn of the century. In 1966 the engineering conglomerate Siemens AG was formed. A wide range of stamps and other ephemera served to illustrate the story of this remarkable engineering family. Gerrit Kemerink from Holland spoke next on ‘Forgotten electrical accidents and the birth of shock proof Xray systems.’ In the early days the practice of radiology was a dangerous business. The high voltage and currents and wiring systems with no insulation were prone to catastrophic accidents. Most accidents occurred during fluoroscopy and basic radiography. Body parts such as the head or hands would inadvertently touch high tension cables with lethal consequences. It is important to remember that although the numbers of radiation martyrs were greater totalling around 395, there were 33 electricity martyrs. Shockproof systems were introduced in 1935 and shielded high performance cables in 1928. A string of safety measures were introduced in the twenties and thirties resulting in a reduction in numbers of these accidents from the forties onwards. 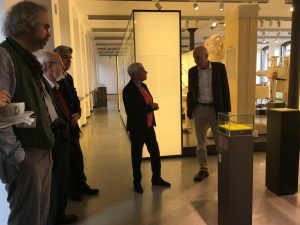 Roddy Cameron from Scotland next spoke on ‘ Dr George Pirie, early Xray development in Dundee, Scotland.’ The introduction of Xrays to Scotland with Kelvin, and Dr Mc Intyre’s contributions was reviewed and the early days in Dundee described. George Pirie the first radiologist or medical electrician made early contributions at the Dundee Royal infirmary. Along with Professor Reid the Physiology Professor he joined the long line of selfless self experimenters. He developed the radiology services in Dundee which in 1913 was doing over 2400 cases and he eventually suffered radiation damage to his hands and had his hands amputated and was one of the early British radiation martyrs. He was awarded a Carnegie Hero Medal in 1926. During the lunch interval delegates went on a tour of the Siemens Museum . A fascinating collection of material pertaining to the early formation of the company and the early days of Xrays was on display. Early Xray equipment, tubes, screening devices, early ultrasound equipment etc were all in the collection. In addition early dental equipment and pacemaker technology all gave an insight into the diverse medical technological developments made by the company throughout the twentieth century. Dr Arpan K Banerjee from Birmingham, UK spoke on ‘Neville Finzi a British radiology and radiotherapy pioneer and radiology benefactor. Finzi who was a radiologist at St Bartholomew’s hospital, London was interested in high voltage radiation treatments and became a pioneer in the treatment of laryngeal cancer. He treated Sigmund Freud during his last days in London. He was associated with the radiology section of the Royal Society of Medicine in London and was President during 1943/44. He was an expert in Radium treatment, harmful effects of radiation and was interested in radiology history writing a number of papers on this topic. He was a bon viveur, with an interest in music and mountain climbing. He also was a great radiology benefactor leaving a large sum of money to the radiology section of the Royal Society of Medicine where eponymous prizes and lectures are delivered in his honour. Liz Beckmann followed with her talk on ‘Godfrey Hounsfield- biographical notes.’ The early days of this great pioneer were described with Hounsfield’s early schooling in Magnus Grammar School in Newark being a fairly unremarkable beginning to what he subsequently went on to achieve. It was nice to get a human perspective on this remarkable man who was best described as a retiring, shy, modest batchelor who never felt comfortable in the limelight but was happiest when trying to solve problems – a true scientific genius whose discovery of the CT scanner went on to revolutionise medical practice. Stefan Dirnberger then spoke on the German radiologist and pioneer of Xray cinematography. His connections and work during the Nazi regime were described and especially fascinating were the original movie clips of his studies of swallowing and deglutition. His pioneering cinematographic studies and prodigious industry and publications and educational films remain an unusual legacy which Dr Dirnberger has been unravelling in his researches. Next Prof Thomas talked on ‘Dawson Turner and Sir Patrick Heron Watson’ . Watson was a nineteenth century Edinburgh surgeon with a wide range of medical interests . His publications covered subjects as diverse as venereal diseases, orthopaedics and anaesthetics. He encouraged women to study medicine at a time when misogyny was rife in the medical profession . One of his pupils Sophie Jex-Blake went on to found the the London school of medicine for women later known as the Royal Free hospital. Dawson Turner was a early radiology pioneer at the Edinburgh Royal Infirmary. He was in charge of the electrical department as it was then called and eventually lost three fingers and an eye from radiation effects. He wrote the book ‘The Manual of Practical Electricity’ and also ‘Radium its Physics and Therapeutics’ the latter published in 1911. He was a radiation martyr like so many of the early pioneers. The final talk of the day was delivered by Stephan Popp from Würzburg , Germany ‘Who was first? Claims on the discovery of Xrays’. Although today we associate Rontgen with the discovery and all the accolades that followed, there were other scientists working on the problem before him. Today the names of Francis Hauksbee is little remembered but he demonstrated a discharge in a vacuum as long ago as 1705 presenting his research to Isaac Newton at the Royal Society. The contributions of Crookes and Goodspeed were described as well as the contributions of Tesla and Puluj and Lenard and others who unfortunately did not realise the significance of their work and hence missed out on the glory awarded Rontgen in 1895. 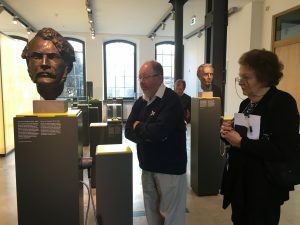 The meeting was closed by Dr Uwe Busch who must be thanked for organising an excellent meeting and Doris Vittinghoff and the Siemens museum staff for hosting it in the Museum. This entry was posted in Meeting, News, Posts. Bookmark the permalink.